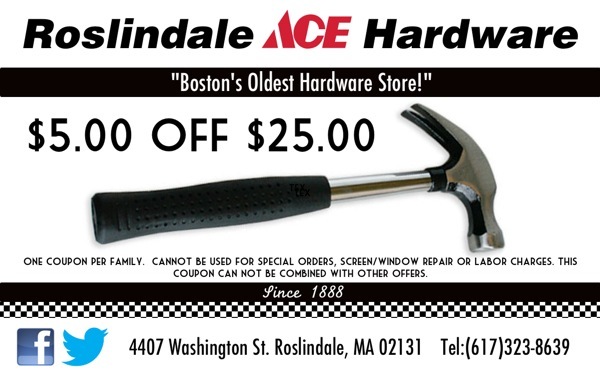 Proudly serving Roslindale since 1888! Come visit us for personal service and individual attention just like the good-old days! We are a family owned hardware store offering key duplication, window and screen repair, fax service, electrical & plumbing supplies, paint, tools, ice melt, seeds, and just about anything a homeowner, contractor or you might need! As an ACE retailer, we have access to thousands of hard-to-find items. If we don't stock it, we're usually able to get it! You can directly order from the Ace Hardware site and have it shipped to our store for free, or simply call or visit us in person. We're always glad to help! Best of all? We've got parking in the rear! Please print this coupon and visit us soon! Keep it Local!!! Please visit our friends at the Pet Cabaret directly across Washington! Copyright 2010 Roslindale ACE Hardware. All rights reserved.